Magnetite’s wet and dry methods of co-processing technology main deal with SP by three magnetic and then wet magnetic materials. The magnetic field strength used in magnetic is 400―1200GS, and the speed magnetic drum is 60―320 r/min. Wet material is taken off water to get iron ore powder. In geranal speaking, iron content in iron ore powder in the mines with 35% rail can get 68―70% after this method. 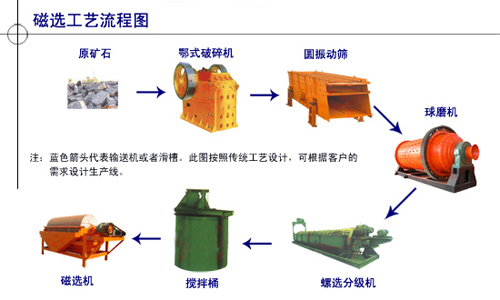 By this joint processes, the utilization of mine can reach 90%, and less water is used during this process. This process can save water, reduce cost and pollution. The dust produced in the process is trap by dust removal device, and do not pollute the air. This method has the characteristics of high production efficiency and well product quality.